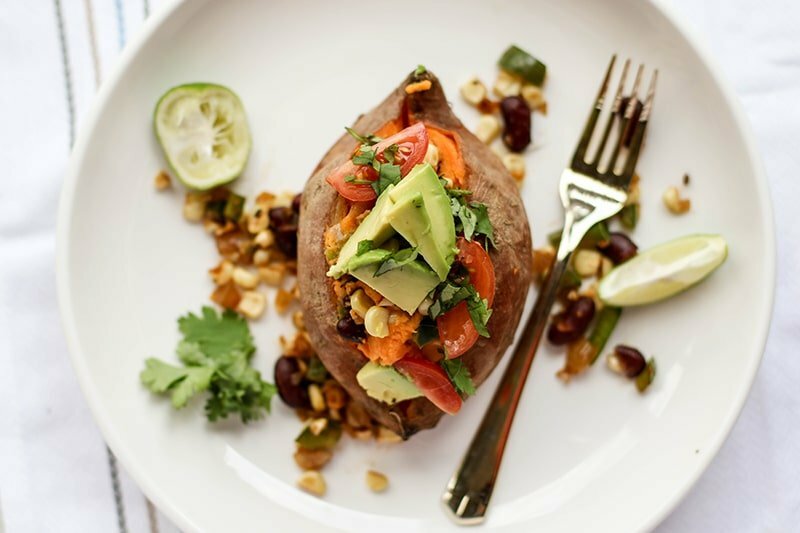 These SW Stuffed Sweet Potatoes are a great way to jazz up your baked potato routine. These take only a few ingredients you probably have on hand. Mexican food is my favorite. Or sweet potatoes are my favorite. I guess my absolute favorite is when the two collide. I wasn’t sure a baked sweet potato could get any better . . . but these are amazing. Sweet potatoes are one of my favorite quick-healthy meal options. If I just want to cook up some turkey burgers or some grilled chicken, slicing sweet potatoes and baking them is the perfect 5 minute (prep) side. Throw them in the oven for 20-30 minutes, and perfection. Baking sweet potatoes takes at least twice as long, but certainly is also easy. I usually don’t bake sweet potatoes unless it’s a holiday. They are my favorite Thanksgiving side. Simple, sweet, creamy, and perfect. Over the holidays, I used leftover, perfectly creamy and smooth sweet potatoes for my Leftover Turkey and Sweet Potato Enchiladas, and also for my Leftover Turkey Collard Wraps. If you’re a sweet potato fan like me, Pin those and remember to make them next holiday season! Sweet potatoes are actually slightly higher in calories than white potatoes, but they are recommended over white potatoes because they are higher in fiber, vitamins A and C, and calcium. We can thank that beautiful deep orange color for all those healthy vitamins and minerals. Plus, in my opinion, they just taste better! I love white potatoes, but nothing compares to a sweet potato. These potatoes aren’t a lot of work to make, but baking sweet potatoes does take a lot of time. The best method is to cook them in the oven for hours, but if you’re short on time, you can microwave sweet potatoes for 5-9 minutes (depending on the size of the potatoes and your microwave), and then could be scooped, filled and topped– cutting down the cook time of this recipe by a lot. Make it Paleo/Whole30: Omit the corn and beans, and sub ground turkey, chicken or beef (I would season the meat with chili powder, cumin, paprika, oregano and sea salt). 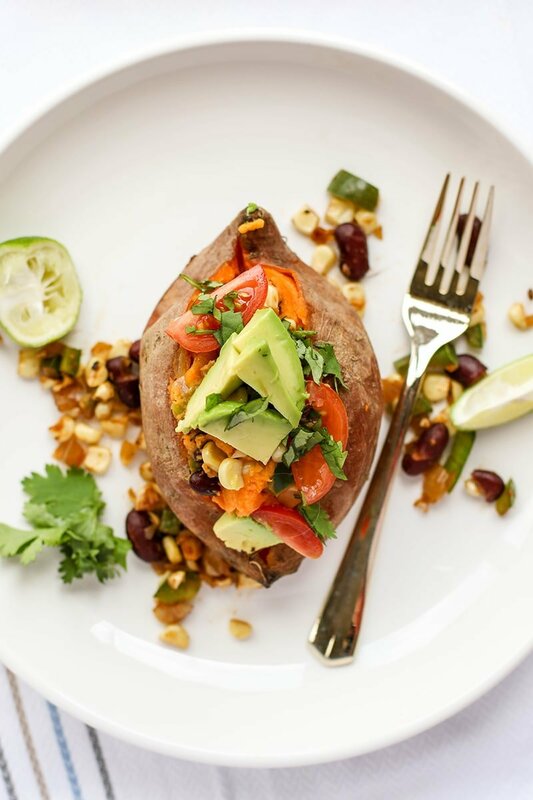 These Tex-Mex inspired sweet potatoes are a fun and nutritious dinner option. These are actually amazing cold, so work well as meal prep and lunch options. Piece each sweet potato several times, then bake for 1-1 1/2 hours, until the centers are really soft. In a frying pan, add olive oil, and heat the pan over medium heat. Add diced onion and peppers, and saute for 7-10 minutes until softened. Add corn and beans, and season with sea salt, cumin, paprika and oregano, and saute for another 3-4 minutes until warmed. When the sweet potatoes have finished baking, allow to cool for 10-15 minutes, and then slice down the center and remove about half of the flesh. Add the sweet potato to a large bowl, add lime juice, and mix until really creamy. If you don't cook your sweet potatoes long enough, and they don't cream on their own, add butter and almond milk to make them really creamy as you mash them. These are optional, and I don't add them when my potatoes are really soft. Add the bean and corn mixture to the sweet potatoes, and mix well. 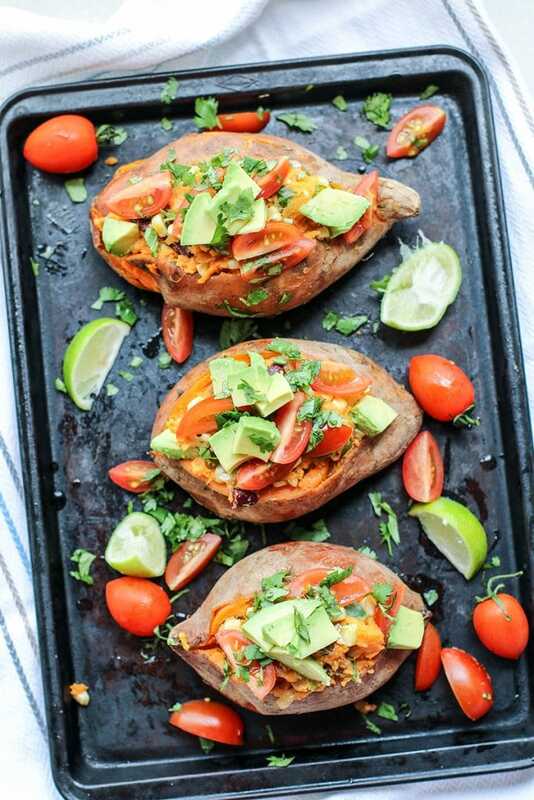 Divide the mixture between the sweet potatoes, and then top with tomatoes, avocado, and cilantro. 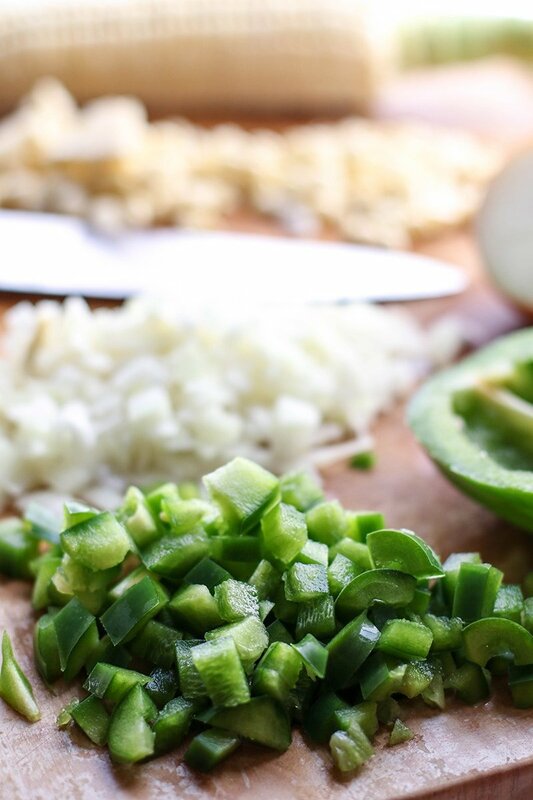 Add other toppings, like cheese, salsa or hot sauce. 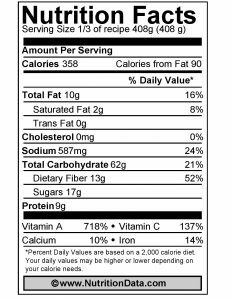 Nutritional data for SW Stuffed Sweet Potatoes and images courtesy of www.NutritionData.com. Sweet potatoes are sometimes forgotten after the holidays. I love that you've made them the star of the show, YUM! They are always the star :) Love them. I love this idea of stuffing sweet potatoes. They look absolutely delicious! This is so good! I can sit in front of the Tv with this and be perfectly happy on a weeknight. 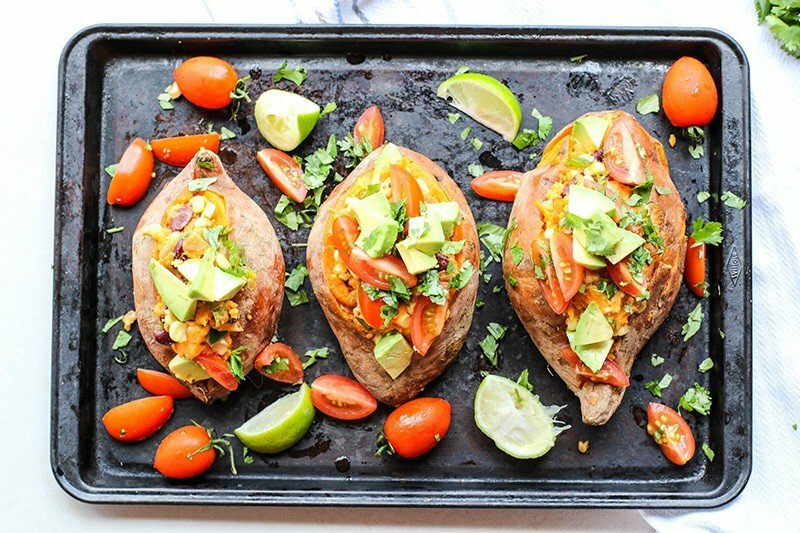 I have never baked sweet potatoes, they look awesome and the toppings here sound delicious.